MAM Project 001 will feature Milwaukee-based artist, Santiago Cucullu. Born in Buenos Aires (Argentina) in 1969, Cucullu studied art in the United States (majoring in painting) and now uses diverse media including mural drawings featuring contact paper and installations made out of table skirting. As the colors of both the contact paper and table skirting are restricted to those available commercially, Cucullu hasn't the freedom to mix and blend colors as artists do in paintings. Furthermore, the wood grain pattern of the contact paper is a cheap imitation of a natural material. In Cucullu's work, these materials are removed from their intended roles and reincarnated as art. 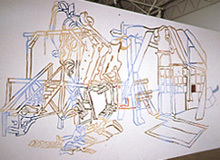 A variety of themes - from historical events to elements of subculture - influence the subject matter of his wall drawings. The results raise questions about almost-forgotten facts and preconceptions. And these images, freed from the restrictions of canvas, continue to expand inside the observer's imagination. At first glance, Cucullu's work is graffiti-like and the materials appear cheap, but they possess an undeniable solidity and beauty. In this work the artist deliberately raises questions about painting, authenticity and the criteria for measuring beauty. Cucullu's art will be allowed to roam freely through the public spaces of the Tokyo City View. Look forward to an encounter with Cucullu's work in the most unexpected places.